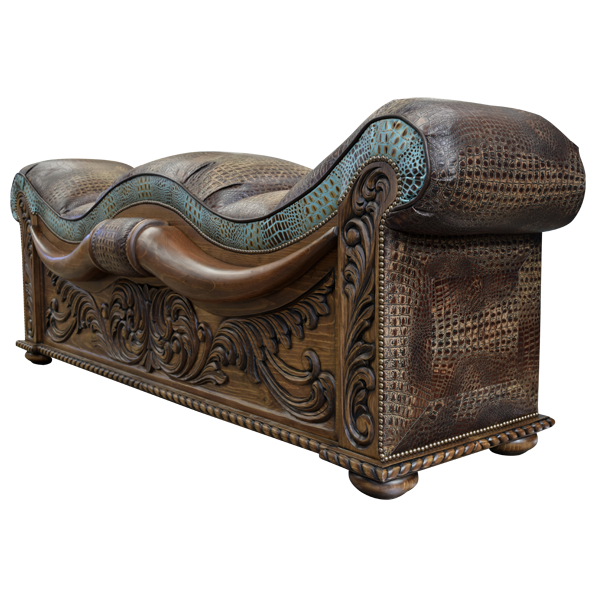 Enhance your Western décor with the exotic, textured upholstery of this gorgeous, handcrafted, Western style bench. The seat and the armrest have an innovative, curved design, and the seat, the armrest, and the lateral sides of the bench are upholstered with simulated, crocodile patterned, full grain leather. The front of the seat is covered in turquoise colored, patterned, full grain leather. 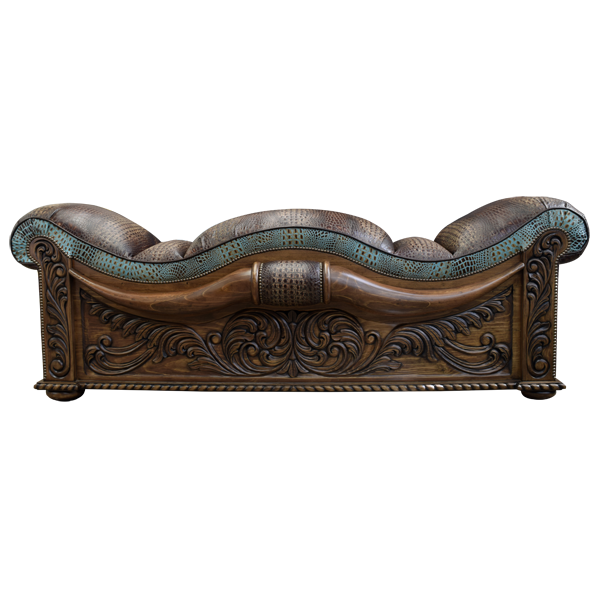 The leather is double stitched for extra strength and durability, and the upholstery is also precision hand tacked to the frame with decorative, gilt nails. The front of the bench is adorned with spectacular, hand carved, steer horns that extend to both sides of the bench. The center of the horns is covered with rich, patterned, full grain leather, and the leather is secured by decorative, gilt nails. The area below the steer horns and its uprights are embellished with luxurious, hand carved, floral and scroll designs. The lower base of the bench is enhanced with an elegant, hand carved, twist rope design, and the entire bench rest on lovely, hand turned feet. The bench has a classic finish, and it is made with the best, sustainable, solid wood available. It is 100% customizable.